The CAS challenge this week (#59) on SCS is an Inspiration challenge featuring New York City! I have never been there...big cities are some of my favourite places to visit...I love the hustle and bustle, being able to walk or take the subway everywhere and of course great shopping & food! I am super excited that DH and I are planning a little May getaway to, you guessed it, NYC!! Can't wait! Whenever anyone has described NYC to me, they always mention the noise and the honking cabs. I had to use my "beep beep" stamp from A muse on this one. I stamped the Cityscape stamp (A muse) on watercolour paper and used my waterbrush & SU watercolor wonder crayons to paint the buildings in bright colours...the thing I love about watercolouring is that you can be a bit messy with your colouring and that's OK! 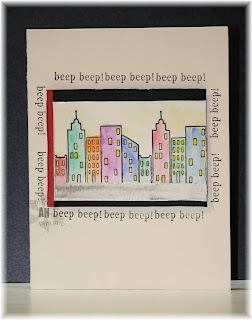 The main image was framed with the "beep beep" stamp (thank goodness for my stampamajig!). I added a black border around the main image, and as an afterthought, also added a strip of red for some more colour. Hope you like it and that you can play along in the challenge! !